This includes Dr. T's repair, maintenance and improvement books on the vintage 1950's viewers. The foremost expert on vintage stereo viewers shares his insights on repairs and the history of various 3D viewers. This section is reserved for 3D books with the viewing method (lenses) included in the book. It includes Back to Basics, Stereo Infra-Red Landscapes and Stereo Infra-Red Nudes. 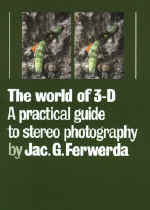 This includes Ferwerda's 3D tome, a mounting manual and a reproduction of the Realist Instruction Manual. The section includes technical books that cover stereo photography and mounting and historical books about the history of 3d photography.. These include Starosta's Overdrive Poster.. These books have stereo pairs of rocks, fossils, maps and contours. They are educational and eye candy too! These are CD for your computer with images in anaglyph (red/blue), side-by-side or DepthCharge format. These include Lewis and Clark, Mars in 3D and several other options.